This fact has a nice explanation in terms of the 'heavenly sphere'. Mathematically, this is the 2-sphere consisting of all lines of the form where has . In special relativity such lines represent light rays, so the heavenly sphere is the sphere on which the stars appear to lie when you look at the night sky. This sphere inherits a conformal structure from the Minkowski metric on . This allows us to identify the heavenly sphere with , and it implies that the Lorentz group acts as conformal transformations of . In concrete terms, what this means is that if you shoot past the earth at nearly the speed of light, the constellations in the sky will appear distorted, but all angles will be preserved. In fact, these results are not special to the complex case: the same ideas work for the other normed division algebras as well! The algebras and are related to Lorentzian geometry in 3, 4, 6, and 10 dimensions, respectively [63,64,65,78,86]. Even better, a full explanation of this fact brings out new relationships between the normed division algebras and spinors. In what follows we explain how this works for all 4 normed division algebras, with special attention to the peculiarities of the octonionic case. When is at least 2-dimensional, we can build a projective space from the Jordan algebra . The result is none other than the heavenly sphere! To see this, note that aside from the elements 0 and 1, all projections in are of the form where has norm one. These are the points of our projective space, but as we have seen, they also correspond to points of the heavenly sphere. 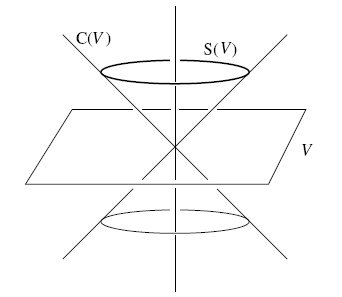 Our projective space has just one line, corresponding to the projection . We can visualize this line as the heavenly sphere itself. This gives another proof of something we already saw in Section 3.1: is an -sphere. But it shows more. The Lorentz group has an obvious action on the heavenly sphere, and the usual conformal structure on the sphere is invariant under this action. Using the above isomorphism we can transfer this group action and invariant conformal structure to in a natural way. This gives a homomorphism from to . This homomorphism is two-to-one, since both and act trivially, and it maps onto the identity component of . It follows that is a double cover of . The exact same construction works for , so is a double cover of . For the other two normed division algebras the above calculation involving determinants breaks down, and it even becomes tricky to define the group , so we start by working at the Lie algebra level. We say a matrix with entries in the normed division algebra is traceless if the sum of its diagonal entries is zero. Any such traceless matrix acts as a real-linear operator on . When is commutative and associative, the space of operators coming from traceless matrices with entries in is closed under commutators, but otherwise it is not, so we define to be the Lie algebra of operators on generated by operators of this form. This Lie algebra in turn generates a Lie group of real-linear operators on , which we call . Note that multiplication in this group is given by composition of real-linear operators, which is associative even for . whenever is a traceless matrix with entries in . Since is hermitian whenever is, this representation restricts to a representation of on . This in turn can be exponentiated to obtain a representation of the group on . Putting this together with our earlier observations, it follows that acts as conformal transformations of . is nonzero but has determinant zero, so it defines a point on the heavenly sphere. If we restrict to spinors of norm one, this trick reduces to the Hopf map. This clarifies the curious double role of as both the heavenly sphere in special relativity and a space of propositions in the quantum logic associated to the Jordan algebra : any point on the heavenly sphere corresponds to a proposition specifying the state of a spinor!